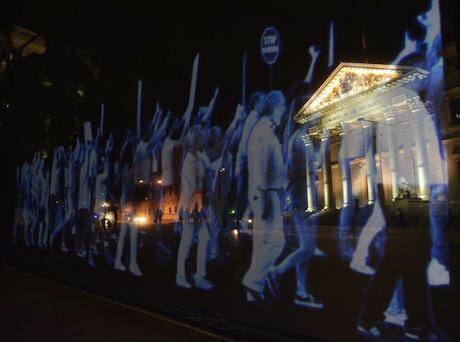 A ‘hologram protest’ outside the Spanish Parliament. Demotix/ Marcos del Mazo. All rights reserved.The Spanish people, who have taken to the streets on numerous occasions over the past few years, did so believing in their right to participate in public affairs, in their right to have their voices heard by the government, and in their understanding that democracy should never be taken for granted. And how has the Spanish government reacted to this social protest? Its response has taken the form of a set of legal reforms that restrict rights and liberties, the cornerstones of democracy. In doing so, the rule of law is threatened. The recently approved Law on Public Security – together with the new Criminal Code – have been adopted in a very specific context that the organization Rights International Spain has called "the vicious circle of injustice." In Spain, since the start of the financial crisis in 2008, demonstrations have increased by 283 percent. The public has relied heavily on this fundamental right as a means of expressing its opposition to political corruption and austerity policies as well as calling for greater transparency and public participation in decision-making. Public protests have occurred, among other places, outside government buildings, officials’ residences and banks, as well as in private homes to prevent evictions. The Spanish government initially attempted to restrict and deter the public from peaceful protest through the use of criminal charges and the imposition of administrative fines. However, the courts have dismissed a number of the criminal charges and most administrative fines have been annulled. Instead of reconsidering the restriction of civil liberties, the government pushed forward the approval on 16 March of three laws, which constitute a ‘threefold gag’. The new Law on Public Security threatens the effectiveness of the rights to freedom of assembly and expression, on the one hand, due to the fines that may be imposed on protesters and secondly, because of the deterrent effect it will have on society as a whole. With regard to the freedom to peaceful assembly, this law has three very clear and worrisome objectives: it seeks to turn the requirement of providing prior notice of demonstrations into a de facto authorization process by the government, which breaches human rights standards; secondly, it seeks to prevent the use of public space for political participation; finally, it imposes sanctions on forms of social protest that are absolutely peaceful and legitimate in a democratic society. The Law on Public Security also affects freedom of expression and information, for example, by allowing the imposition of fines for the use of images of law enforcement officers taken while on duty in public settings. This will additionally lead to impunity in cases of excessive use of force by the police, as such images are generally the main evidence used in proceedings against them. The Criminal Code reform also intends to criminalize different types of peaceful protest by, for example, listing passive resistance (such as sit-ins, or the formation of human chains) as a crime against authority. It is also concerning that the new crime of “dissemination of messages” can be applied to those who simply call for a demonstration, and that other forms of legitimate protest, such as the peaceful non-violent occupation of public offices and banks, are being criminalized. A counter-terrorism reform has also been approved, through an urgent legislative process, and behind the back of civil society, disregarding the UN Special Rapporteur’s recommendations on counter-terrorism and human rights that require the Spanish government to carry out a genuine review process in broad consultation with independent human rights and criminal law experts. The law introduces excessively vague and imprecise concepts, in conflict with the requirements of predictability, clarity and proportionality that must be met by any law that restricts human rights to allow citizens to adapt their conduct to the new legal order. This constitutes a clear violation of essential principles of the rule of law and may give way to the arbitrary enforcement of criminal law and disproportionate restrictions of fundamental freedoms, such as expression, information and assembly. According to international human rights standards, when introducing restrictions on fundamental rights, governments have the obligation to justify their actions by establishing that the purpose of the restriction is legitimate and that the action taken is necessary to achieving this legitimate aim, in the context of a democratic society. Despite this obligation and the depth of the reforms, the Spanish government has not justified the existence of a ‘pressing social need’. No background studies or impact assessments have been produced. Nor has the government engaged in adequate consultation with stakeholders, civil society organizations and human rights experts. Five United Nations Special Rapporteurs have also expressed concern that these reforms are indeed a response by the Spanish Government to the numerous demonstrations that have been carried out in Spain in recent years. These UN experts have also warned that the reforms threaten to violate fundamental rights and freedoms and have urged the Spanish government to withdraw them. Human rights experts, and representatives of the legal profession and the judiciary have also called on the government to respect human rights. Yet the Spanish government has not given due consideration to any of the serious concerns voiced by experts. We are clearly in the midst of a backslide. In the face of the ineffectiveness of existing mechanisms to prevent these threats to the rule of law in Spain, Rights International Spain has been forced to call on the European Commission to take action. The Commission set out last year a new framework to safeguard the rule of law against systemic threats that so far has not yet been applied in any country of the European Union. This mechanism is based on the acknowledgement that the rule of law is a core value of the European Union and thus has to be respected by every Member State. Respect for human rights, justice and the rule of law is essential for the correct functioning of our democracies. If these are attacked in one country, they are attacked in all.